A side benefit of learning to draw is getting to know your own brain a bit better - for example, how, for you, these two modes compete and cooperate. Here is a quick exercise designed to illustrate the mental conflict that can occur between L-mode and R-mode. 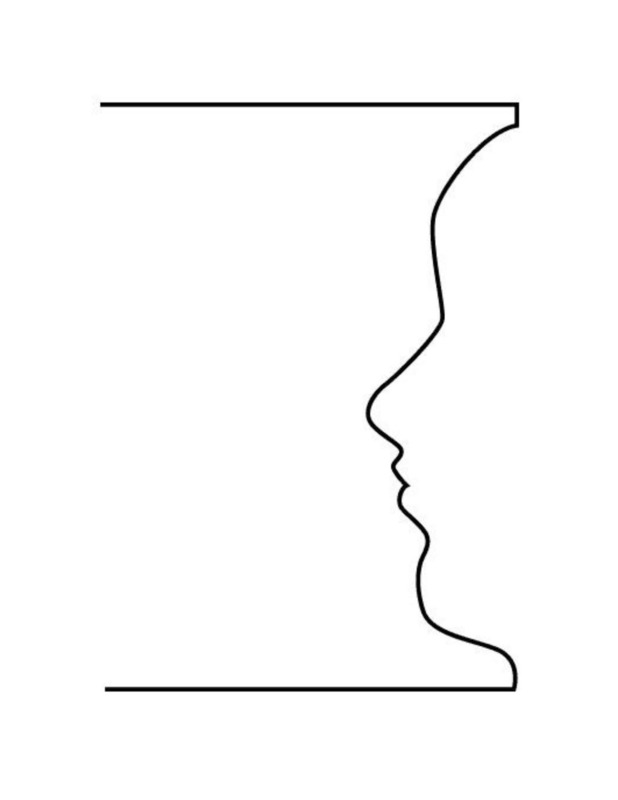 This is a famous optical illusion drawing, called "Vase/Faces" because it can be seen as either two facing profiles or as a symmetrical vase in the center. Your job, of course, is to complete the second profile, which will inadvertently complete the symmetrical vase in the center. Before you begin: read all the directions for the exercise. 1. If you are right-handed, print the Vase/Faces Template on the right; if you are left-handed, print the Vase/Faces Template on your left. Take up an ordinary, sharpened pencil, sit at a table in a quiet place, and commence this exercise. 2. Redraw the profile already printed. Just take your pencil and go over the lines, naming the parts as you go, like this: " Forehead... nose... upper lip... lower lip... chin and neck." Even do this a second time, really thinking to yourself what those names mean. IMPORTANT: Wait until you are finished with your Vase/Faces drawing, then scroll down below for Dr. Edwards' explanation of this exercise. First, I asked you to redraw, even twice, the line of the original, given profile, naming each feature as you drew it (forehead, nose, etc. ), thus strongly "plugging in" the verbal system of the brain. Then I asked you to begin to complete the second profile, thus inadvertently and simultaneously completing the vase. Because the facing profile is reversed, it can only be done by shifting to the visual, spatial, relational right mode (R-mode) of your brain. The difficulty of making that mental shift causes the feeling of conflict and confusion -- and perhaps even a momentary mental paralysis. Didn't you feel it? The solution to the conflict, of course, is to draw just what you see without naming the parts. Some people are aware of giving themselves instructions, such as, "Don't think about the features. Just draw where the line goes in and out." Some decide to draw from the bottom up, ignoring the features. Some decide to draw a line down the middle to help see the relationships. Some decide to grid the drawing. 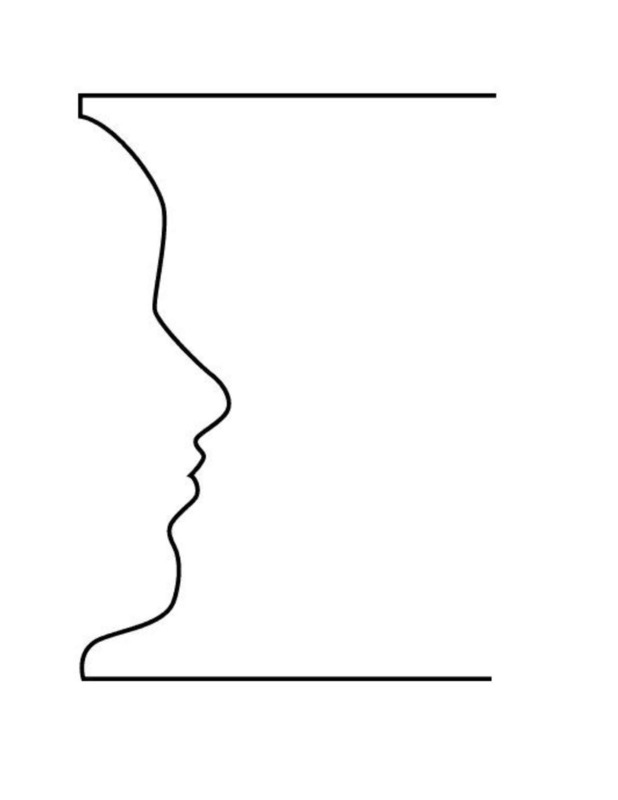 Some turn the drawing upside down, to become unaware that they are drawing a profile. Perhaps you gave yourself entirely unique instructions in order to bypass the verbal system. In conclusion, this exercise illustrates a main requirement of learning to draw your perceptions: You will learn to damp down your brain's verbal mode and gain access to your non-verbal, visual perceptual mode. These are all good solutions, and the exercise is an effective demonstration of the need, in order to draw, to damp down the verbal system and simply draw what you see.